Recent protests in Iran will have unearthed distant memories for the Iranian population. In late December 2017, and early January 2018, protests tore across the Iranian nation. 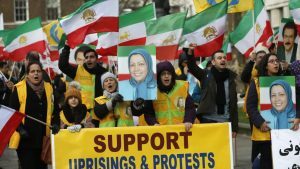 The People’s Mujahedin of Iran (MEK) had a major role in organising the protests. The nation’s men, women, and youth from all walks of life took to the streets to express their desire for regime change. 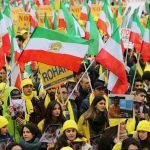 The urban middle classes stood alongside rural farmers and agricultural workers, along with the rest of the population, and came together in chants of “down with Rouhani” and “down with Khamenei”. Iran has heard similar chants before. Forty years ago, in 1978, after the annual Nowruz celebrations, similar chants rang out across Iran. Nasser Razil describes how protestors gathered in Tehran, shouting “down with the Shah”. Then, as now, the country was in the grip of autocratic power, with a heavily oppressed population calling out regime change. The parallels between the climate of 1978 and that which we see today are not limited to Iran’s internal political struggle. In 1978, western governments were convinced that the Shah would emerge from the protests with his regime intact. Just weeks before Nowruz, Jimmy Carter had called Iran an “island of stability in one of the more troubled areas of the world”. The UK Foreign Office also maintained a blind faith that the Shah was in control of the situation. Fast forward to today, and the same attitude can be seen towards Iran from the western powers. There has been a prevailing school of thought in western governments that Rouhani’s oppressive regime has the support of the poorer classes and possesses the strength to whether the storm and put down the dissenting population. This has clearly shown to be false. The recent protests indicate that the poorer communities have just as much desire for regime change as the urban middle classes. In Isfahan Province, it was the farmers that triggered mass public mobilisation in early April, disgusted at the regime’s inability to handle a water crisis. The recent protests raged for ten days, indicating that the regime could not quash the dissent. There were even reports of State Security Forces abandoning their posts and joining the protestors. The regime’s strength is evaporating, and there are clear signs that, like the Shah’s regime in 1978, it will not be able to maintain its grip on power for much longer. Washington is currently re-examining its position on Iran. 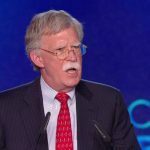 It will soon have to decide whether or not to adopt a firmer stance against the Iranian regime or continue with its policy of appeasement for the ayatollahs. The appointment of John Bolton as the new National Security Advisor to President Trump is a positive sign. He has long sympathised with the MEK and its leader Maryam Rajavi and will likely push for a harder stance towards the Iranian regime. However, those who do not learn from history are doomed to repeat it. In 1979, when the Shah regime fell, western governments were in shock and were left scrambling to formulate a policy towards the incoming government. The same signs that were present in 1978 are visible today. Foreign governments must read them and react. The Rouhani regime is losing its grip on power. All segments of the public have turned away from it and are crying out for regime change. The economy is still declining, and farmers have begun to strike and protest. The winds of change are on the horizon. Washington, London, and the other western governments must change their attitudes towards the regime in Iran. It will not be in power for much longer. On Wednesday the International Committee In Search of Justice (ISJ) reported that the Iranian regime has launched a new campaign against Iranian refugees living in Albania. This campaign is the latest effort by the ruling regime in Iran to demonize and suppress the MEK, the principal opposition movement in Iran. The ISJ is concerned that these actions on the part of the Iranian regime could lead to a violent attack by Tehran. The refugees are members of the People’s Mojahedin Organization of Iran (PMOI or MEK), an opposition group that fled Iran’s oppressive regime to escape persecution, imprisonment, torture, and death at the hands of the ruling mullahs. The MEK is the largest and most popular Iranian opposition organization and has the goal of bringing democracy and equality to Iran. Because of this, the MEK has been the primary target of the theocracy’s ire. 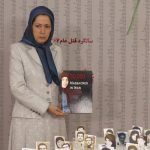 Over the past 30 years, the regime has killed over 120,000 MEK members in its efforts to suppress and demonize the resistance organization. Many of the Iranian refugees in Albania are former residents of Camp Ashraf and Camp Liberty in Iraq. 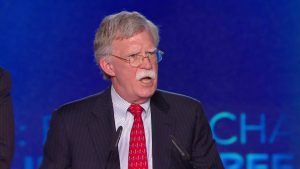 The Iranian regime waged a years-long series of attacks on MEK members in these camps, cutting off access to food and medical supplies and coordinating deadly air raids. 178 camp residents died as a result of these attacks. In response to the continued assaults on Iranian refugees in Iraq, an international campaign to protect and relocate MEK members in Iraq was mounted. Thanks to the bipartisan efforts of American dignitaries, U.S. Senators, and Congressmen, European politicians, members of the European and national Parliaments and international entities including the United Nations, the remaining residents of Camp Liberty were finally moved to locations outside of Iraq, with the largest number settling in Albania. A series of demonstrations took place in Iran in December 2017-January 2018. Protesters chanted, “down with [Supreme Leader] Khamenei,” and “down with [President] Rouhani” in demonstrations in 140 cities across Iran. 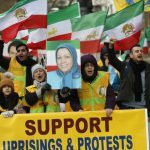 The fundamentalist regime was rattled by this uprising and acknowledged that the MEK played a large part in organizing the protests. The Iranian regime has now focused its efforts on the Iranian refugees in Albania. Two Iranians were arrested on March 22 by Albanian police for espionage and attempting to gather intelligence about the refugees. Similar actions in the past have often lead to terrorist actions, so these arrests are cause for concern. 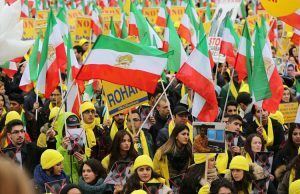 In addition, the Iranian regime is once again disseminating misinformation about the MEK in an attempt to undermine its efforts to bring regime change to Iran. It is currently preparing actions in the European Parliament to demonize the MEK. 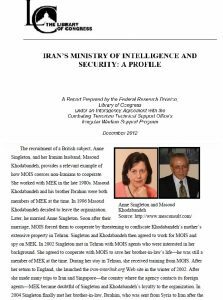 British national Anne Singleton is currently being used by Tehran to sow disinformation about the MEK. 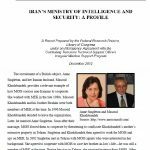 She and her Iranian-born husband Massoud Khodabandeh were recruited by Iran’s Ministry of Intelligence and Security (MOIS) in 2002, according to a Pentagon-commissioned report released in December 2012. They have since led numerous efforts to demonize the MEK. Singleton has traveled to Iraq and Albania several times as part of the smear campaign on the Iranian refugees. 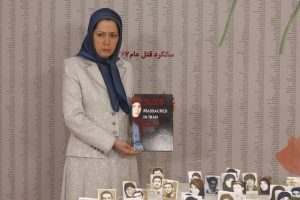 She attempted to spread false information about the MEK in front of British Parliament in September 2005 but was disinvited after protests from Members of Parliament. She is now scheduled to speak next week at the European Parliament to make more false allegations against the MEK. The ISJ expressed grave concern about these events, fearing that they will lead to more assaults on MEK members in Albania. The organization urges authorities to take action against the ruling regime to prevent them from endangering the refugees and security in Europe as well. Protesters Seek Change in Iran During Fire Fest Demonstrations-Photo ArchiveProtests erupted in Iran on Tuesday as people across the country rose up to protest the mullahs’ rule. Demonstrations were staged in cities across Iran to take place during the yearly Fire Fest celebration, which marks the last week of Iran’s calendar year. A network within Iran associated with the People’s Mojahedin Organization of Iran (PMOI/MEK) issued a call for citizens to use the occasion to protest the ruling regime, and the people heeded the call to action. 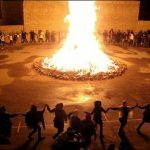 The Persian Festival of Fire, or Chaharshanbe Suri, has long been the subject of the mullahs’ ire, as it predates Islamic rule, with the ruling regime attempting to prevent public gatherings for the celebration. The Fire Fest combines the mullahs’ disdain for cultural celebrations with their fear of free assembly by the Iranian people. Clashes between the government and its people are common during cultural celebrations, and the backlash was severe this year, with the recent uprisings fresh on everyone’s minds. 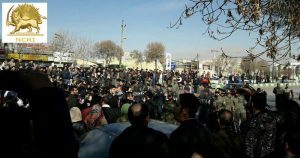 Since the uprising beginning in December of 2017, the mullahs have been increasingly fearful of further public demonstration. 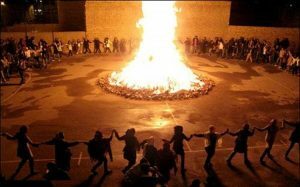 The authorities claimed that people were free to celebrate their cultural traditions as long as they did not pose a threat to public order, but the dissident organization PMOI/MEK reported that the ruling regime dispatched Revolutionary Guard-controlled civilian militias to municipalities across Iran in advance of Chaharshanbe Suri in a failed attempt to quash another uprising. The previous large-scale uprising was only quelled after 50 protesters were killed and 8,000 more were arrested, according to the National Council of Resistance of Iran (NCRI). 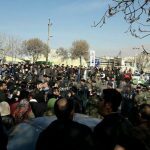 The December 2017/January 2018 uprising began as a protest against the economic plight of Iranians but soon spread to a call for regime change. That call was echoed in Tuesday’s protests. The backlash to the demonstrations was swift and severe, with many protesters detained or injured. Those who were detained will be held until the end of Nowruz, the Iranian New Year. The West has become more aware of the growing unrest in Iran and is working toward measures to support Iran’s people. In the U.S. the Trump administration is becoming receptive to the movement and could help by targeting the Central Bank and the Revolutionary Guard. Europe can strengthen its current efforts to curb Iran’s ballistic weapons program and focus on Tehran’s record of human rights abuses to hasten change in Iran. The oppressive theocratic regime in Iran is harmful to everyone who allows it to continue. Iran’s opposition seeks to create a free and democratic society in which all people are valued. This is a goal that all people can support.